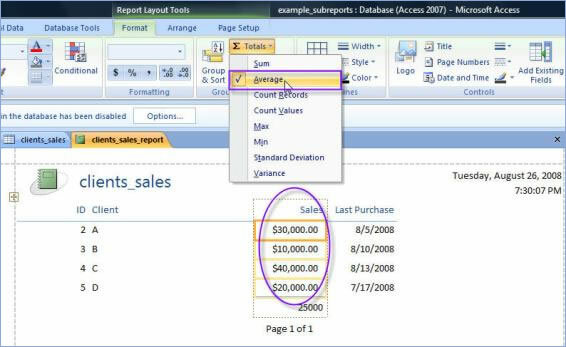 In any Microsoft Access report which contains numbers, you can use several mathematical operations, such as totals, percentages, averages and running sums. In all cases, they make the data more understandable. Using the design view allows you to have a bit more control over the location and appearance of the control. However, for the general user the Design View can be a bit intimidating. There’s a bit of a problem if you want to add percentages to reports. 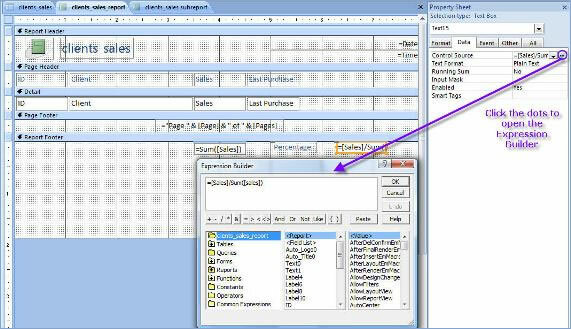 Microsoft Access 2007 cannot calculate percentages like Microsoft Excel 2007 does, so you pretty much have to “help” it. Then go to the Format tab and choose the Percent format for the value. You can also use the Expression builder to add the formula. Obviously if you use groups you can calculate percentages of each item in the group total or percentages of the groups in the grand total. For this example we use the simple percentage of an item in the total (sales of A in the total sales).